That is lovely - so unusual and personal! Well I just LOVE this - haha! I LOVE it! You really do need to keep it up all year long. I have a couple junky signs in progress, but who knows when they'll be finished. Thanks for the inspiration. The sign is beautiful and so creative. That's great, Julia! Very clever using the pieces that you did. ooow very special indeed, what a great way to recycle too, and such a lovely message. LOVE it !! It's wonderful, Julia. I absolutely adore it!! Oh I love this love! I have pinned a couple of these and thought I would make one sometime too. The e is fabulous! I think I'd better see what I have. Love that funky junk style! I have a link party going on now. Share Your Cup Thursday. It's about sharing the things that make you happy. I'd love if you shared this! This is an amazing piece Julia! I think the nails are perfect left the way they are. Have a great weekend. Oh Jules I'm so in love with your junk love sign, too fabulous!!! I have to go and search for things to make one too, maybe a smaller version. Here it is raining on frozen ground right now yuk! Wow klasse mit dem alten Holz, Julia das Teil sieht super aus! Liebe Julia, vielen Dank für Deine Geburtstagsgrüße. Ich habe mich sehr gefreut, wieder von Dir zu hören. Der Wandhänger ist sagenhaft schön! Die Idee und die Gestaltung gefällt mir sehr, sehr gut. I have seen these pieces on pinterest and yours came out so nice. Really unique and I love all the pieces you found to make the letters. Adore this! I must make one for myself...pinning. Thanks for the great inspiration. dein LOVE-Schild ist wirklich der Hammer! Und ich bin fastziniert, welch wundervoll attraktive "Junk"-Teile sich in deinem Vorratlager immer wieder finden. Kannst du mir bitte verraten, aus welchen "Bestandteilen" das V besteht? (Sind das Teile von Bambus-Gartenfackeln? Oder Pfeifen? Oder ... hmmm.... ) Ich find's übrigens auch toll, dass du die Nägel im knorrigen Holz gelassen hast - macht sich sehr gut!!! PS: Vielen Dank für deine immer so lieben Kommentare! Ja, und das mit den Mistengeln in kreativer Hinsicht kenne ich auch - und es ist wirklich fast immer so, dass ich mich dann bei der Ehre gepackt fühle und etwas noch Besseres draus mache! That is very cool. I love you found things to make the letters with. Julia, OHH, it is wonderful my dear friend! 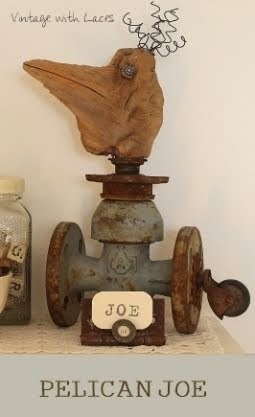 I am in love with your new take of creating art pieces, ...the rawness and altering of different found objects is gorgeous!! 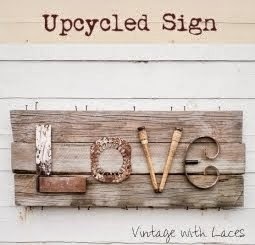 Love your love-sign, The ,E is so beautiful- and it should certainly hang on your wall all year round !! I have not seen this before...I love it!! You are right, love is perfect all year long!! Definitely for every day of the year. Materials we usually associate as being masculine yet there is such elegance to your sign, I absolutely LOVE the idea and the manner you created each individual letter. A fabulous piece of "Greencraft" art. This is just great! You need to make these to sell. I would buy (for the right money). Just love! das Schild ist einfach nur genial!!! LOVE-ly junk love!! I have been wanting to make one too. So glad you left the rusty nails...more junky character!! Das Teil sieht toll aus Julia...ganz nach meinem Geschmack! Altes Holz, Nägel, Rost ~ genial! I just love this - what a perfect piece of art for Valentines and beyond!!! Rustic charm for Valentines Day! LOVE!!! What a charming looking sign...so happy that you came by and shared it at my party this week. I am going to feature it at my party on Monday. Such a cool sign Julia, you just do everything just right! Love your pallet post as well! You and your hubby are a great team! So, so cute!!! Visiting from Knick of Time. Thanks for sharing! This is such a cool LOVE sign! The junk pieces you found are perfect. It's a beautiful piece to hang in your studio - I'm inspired and I'll try and do something similar! this is so wonderful, Julia! you never cease to amaze me with your wonderful creativity!! This is one project I won't forget! I loved it then and I still LOVE it now. Thanks Julia for sharing it at Vintage Inspiration Party Best of 2014. I LOVE this, so to speak ;).Thanks or linking up! vielen Dank für deinen Beitrag - dein Love-Schild liebe ich natürlich schon lange, aber ich habe mich über das Wiedersehen sehr gefreut! Und ich freue mich schon auf weitere Beiträge von dir! What a great idea an it looks so good.